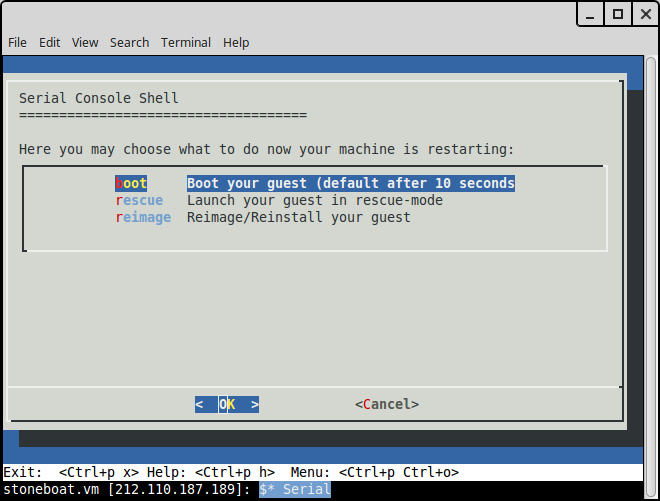 You can use our console shell to reboot your machine and access its serial line. This is normally used to fix minor network or firewall errors when your box would otherwise be inaccessible over the network. The serial line can also be used to change your system’s boot process in an emergency or when you want to reinstall the operating system. If you leave it alone, it will boot normally. The third option, reimaging, is described here. The rescue option causes the host to boot your Legacy Virtual Machine with init=/bin/sh specified to the kernel, and allows you to perform most of the rescue operations. Which Host is my Legacy Virtual Machine On?